Tensions mounted between American-led coalition forces and the Afghan government Monday as Afghan President Hamid Karzai demanded U.S. troops hand over private security guards suspected of involvement in the killing of a top Kandahar law enforcement official. The private security guards, according to the Afghan officials, had forced their way into the Kandahar attorney general’s office demanding the release of an unidentified man. When the guards tried to use force to release the man, local judicial officials contacted the Kandahar police chief. Shortly after the police chief arrived, he and several of his bodyguards were shot to death. In all, a half-dozen people were killed and several others were wounded, the government officials said. 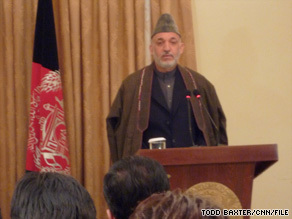 The Karzai government accused the American-led coalition of protecting the security guards and began investigating the incident. The United States never had custody of the guards, who fled after the attack, the U.S. military official said.